Alumni, actives, and friends please check out the exciting message below from Matt Liffmann, the chapter’s Alumni Relations Chairman. Please note that tickets can only be bought by Gamma Rho alumni for themselves and immediate family members. After coming off a fantastic weekend down in Memphis where the chapter won its 2nd consecutive Smthye award, I wanted to let you know about some great things the chapter is doing this upcoming academic year. Below is information on Homecoming, Recruitment, and away football games and how you can get involved. · PIKE is taking over the endzone! Gamma Rho has exclusive access to the north endzone party deck complete with seating and canopied buffet dining included. · Cash Bar in the stadium!! NCAA regulations don’t allow alcohol to be served in general admission so the party deck will also be the ONLY place in the stadium where alcohol will be served. · The game starts at 6pm on 10/22 – meaning tons of time to tailgate. 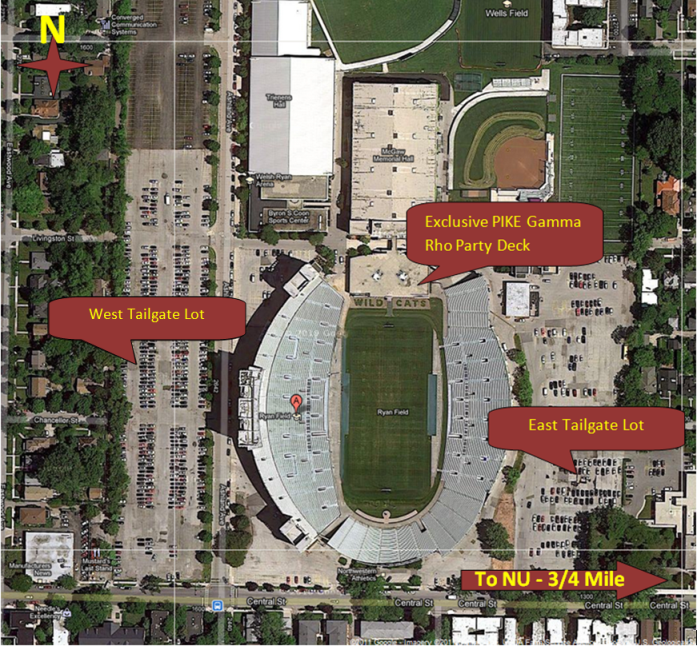 Location TBD but the tailgate will most likely be in the East or West Lot. · Only 120 tickets are available and will sell out so don’t delay and purchase them now! You have been warned. Any remaining tickets after Sept. 15th will be released to friends and family of the actives. Tickets are $75 per person and can be purchased here. Everyone will need a party deck ticket (not general admission) to get into the party deck area. Check out the map below for a detailed aerial view of Ryan Field. This year the chapter is asking for alumni to consider donating toward our traditional football roadtrip. Historically the chapter has taken a charter bus to an away game to cheer on the Wildcats. With around 30 brothers and 20 freshman attending each year, this has historically been the chapter’s best recruitment event which “seals the deal” with many top prospects . Unfortunately, the chapter was unable to do this event last year partially due to cost and we simply have to do this event if we are to reach our goal of undeniably securing the best rush class at NU. We are traveling to Iowa City on October 15th and are looking for alumni to sponsor tickets for the trip at a cost of $50 per ticket. If you would like to donate one or more tickets to the chapter for this event please click here. If you would like to donate an alternate amount please click here. We greatly appreciate any support you can offer. Other Info: Some alumni will be participating in Sailgate, a boat ride tailgate to West Point. Other Info: Gamma Rho’s annual rush event. Please see donation info above. Other Info: Get your tickets here ASAP or order through stubhub (Nebraska doesn’t sell general admin tickets). About 10 actives are making the trek out to Lincoln for this. Shield & Diamond Magazine – Gamma Rho is featured on page 20. Correction: The contact should be our president patrickschnettler2013@u.northwestern.edu or myself, not Patrick Metcalf as mentioned in the issue. Thanks in advance and look forward to speaking to you all soon. If you have any questions or concerns please don’t hesitate to email me.